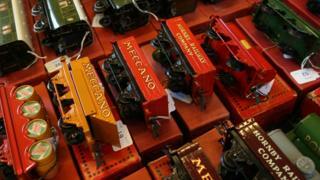 Hornby's directors are to fight against a proposal to remove chairman Roger Canham from the company's board. New Pistoia, the toymaker's second biggest shareholder, want to replace Mr Canham with Ian Alexander Anton, non-executive director of Victoria Carpets. In a statement, the investor group said it felt it was "time for change". However, the board of Hornby, which makes model railways, Corgi cars and Scalextric, said it was "not in the best interests of the company". It said: "The strategy currently being pursued by the board is well thought-out and is working, the current structure and composition of the board is consistent with good corporate governance and the board has the support of a majority of its shareholders." Earlier this month, Hornby announced that it had successfully restructured the UK and European sides of its business, cut back on its products and reduced costs. It revealed in 2016 that it planned to cut more than half of the toys it made after discovering that it generated 90% of its profits from only 50% of its range. This came after its shares fell by more than 50% early last year following a profit warning. New Pistoia has forced a meeting of investors to vote on its proposals and Mr Anton said that he and the company had received "strong encouragement" from some other shareholders. "We believe the current strategy is ineffective, will continue to destroy value and is not aligned with creating wealth for all shareholders," the group said. Mr Anton added: "Hornby is old-fashioned, and that's part of the problem, but there is evidence of a shift from screens to physical toys, such as Scalextric. "Some of those toys have great potential if the company gets the product right, and it hasn't." Mr Canham joined Hornby in 2012 and became chairman the following year. Last year, he also had a spell as executive chairman after Richard Ames left the company.